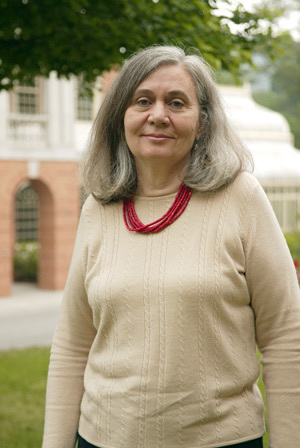 Christianity suffers the burden of some very bad scholarship, Pulitzer Prize winning author Marilynne Robinson told a Samford University audience, noting that many people are poorly educated in things biblical. "In matters religious, the tendency has been dominant for a very long time to let the terms of religious discourse be established by those who have no instinct for it, as if to be insensitive were to be objective, as if to be unbelieving were to be undeceived," said Robinson, whose novel, Gilead, won the 2005 Pulitzer Prize for fiction. "Never wishing to appear naive, or simply deferring to what looks to them like authority, many religious people have subscribed to this view," she said in a lecture in Samford's Reid Chapel on April 26. "What is lost in all this is the biblical vision of the holiness of the God who imputes to the world and to the whole of existence a goodness so great that He Himself cannot turn away from it." Gilead, the fictional account of an elderly Congregationalist minister and his deep Christian faith, also won the $200,000 Graumeyer Award for outstanding work in religion. For her Samford audience, Robinson referenced narratives of Greek mythology, "which have no account of the creation of mankind," but noted that Scriptures still survive, "long after the gods of the Romans and the Greek have become mere fable and statuary." Efforts to undercut Christianity have been made fairly continuously since Paul set out on the road to Damascus, she said, citing the recurring strategy of fourth-century emperor Julian to attack Judaism and Christianity together. The Old Testament, especially the first five books, she believes, is now rarely given a fair reading. "Whenever morality becomes a fashion rather than an obligation, whenever it reflects the consensus of the group without reference to the conscience of the individual, it tends to identify itself by its aversions, to recruit others to its aversions, to become fastidious and vacant and rather mean," she said. The Idaho native earned a bachelor's degree at Pembroke College and a Ph.D. from the University of Washington. Her first novel, Housekeeping, won a PEN/Hemingway Award for best first novel, and was nominated for the Pulitzer Prize. She has been writer-in-residence or visiting professor at many universities, and has taught at the University of Iowa Writers workshop for 16 years. She has taught creative writing at the University of Alabama at Tuscaloosa. Her time in the west Alabama town became important in her writing of Gilead, she said, because it taught her how to see a place in the sense of having a love for it. Robinson, a Congregationalist, also said she drew on her experiences from years of church attendance and her familiarity with the culture of religion to develop the main character in the book. Her Samford lecture was sponsored by the school's Howard College of Arts and Sciences, Department of English, Beeson Divinity School, Samford in Mission and Resource Center for Pastoral Excellence.